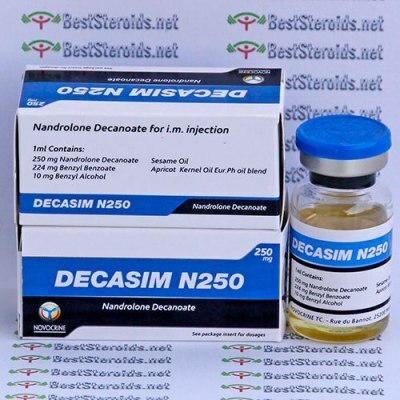 Decasim (nandrolone decanoate) is one of the most popular and common steroids used by athletes of all types. It is a low androgenic steroid which has high anabolic properties. It is not very toxic to the liver, and doesn't distrub the body's hormone functions to much. Decasim can be used for muscle buildup or in preparation for a competition, and is excellent for developing size and strength. It has been stacked it with just about every steroid with positive results. This makes it a good base drug for any cycle. Decasim exhibits significant anabolic effects with minimal androgenic side effects. Considered by many the best overall steroid for a man to use (side effects vs. results) Decasim is most commonly injected once per week at a dosage of 300-500mg. With this amount, estrogen conversion is slight so gyno is usually not a problem. It takes three days after injection to dissolve from the site, and stays active in your body for about 17 days. Because of this your gains will go away very slowly after the cycle, as long as you continue to train. The risk of water retention and aromatization can be prevented with the combination of Proviron with Nolvadex. Awesome product. I gained 27 pounds in 10 weeks from this Deca! After week five it completely eliminated any joint pains I had before I started taking it. Package arrived 12 days after it was shipped and was in great condition. I will definitely buy again. Decasim 500mg/w + Sustasim 700mg/w = LOVE. The gains are insane along with amazing pumps. Kept 90% of all gains with ease. You will love this cycle if you try it People will think your a animal in the gym amazing strenth gains.